Special subsidies for oil and gas companies? Where? Democrats in Congress drafted a bill to end the special subsidies. But... The bill - title below - only removes oil and gas companies from tax treatment that every company gets. They could not find any loop holes limited to oil and gas companies. Bill title is "BUDGET PROCESS AMENDMENTS TO REPLACE FISCAL YEAR 2013 SEQUESTRATION." The Washington Legislature has made promises it cannot keep. Public employees get generous pensions but the Legislature doesn't fully fund them. State investments assume 8% growth of the funds set aside. Sign me up. I want the magic investment too. A Seattle Times editorial proposes switching from defines-benefit to defined-contribution. I agree. And do it now to existing employees. My employer did that to me halfway through my work career. Corruption of an Obamaite. Exposed by the Seattle Times? It is linked to by Jon Talton at Seattle Times!? General Dempsey says protecting the US from attack is on his list of priorities - but down the list. He is busy… Top priority is survival of the US. Good. Next, the stability of the global economic system. Huh? Maybe the Treasury Department should worry more about that than our armed military. Third priority is to protect the US from attack. Who could imagine the US being attacked? On 9/11/2001!. Fourth priority is to promote American values abroad. From the Trail of Tears - forcibly relocating American Indians with lots of deaths - to blocking schoolhouse doors to blacks to abandoning South Viet Nam to the impeachment of President Clinton for lying under oath and the US losing our AAA bond rating. From John Hawkins at Townhall. To Hangzhou, China to visit son David, September 21 to October 6, 2012. A million photos on one page. A "feature" of Blogger aka Blogspot. The sequester and its automatic spending cuts belong to Obama. Now President Obama is blaming Republicans in Congress. For what He did. Then in November, 2011 he threatened to veto any Republican effort to end the automatic spending cuts of his sequestration. “There will be no easy off ramps on this one.,” he added. Why doesn't Obama accept responsibility for what he did and defended with veto threats? The (shifty animal here) is hard to corner. But Jay Carney did admit that the "dangerous" sequester that he says is terminally dangerous was proposed by The One, President Obama. Will this (six tax increases) be enough? Committee Chairman Andy Hill asked each testifier: Will this (all six tax increases) be enough? The WEA just couldn't find words to answer. Their answer has always been: we need more money. It looks like it still is. Tim Eyman's latest initiative to requires a 2/3 majority to increase taxes or a vote of the people passed in all 39 counties. Gore laughs when asked "Mr. Former Vice President you have railed against oil companies for years. You sold to a company that is owned by the government of Qatar, which gets most of its revenue from oil. Do you like money more than the beliefs you have espoused for years?" It is estimated that he gained $70 to $100 million on the sale. Surely he cannot be held to the standard he uses on others. Now his Al-Jazeera has broadcast death threats to those who leave Islam. Thursday you will want to ask distinguished Nobel laureate Gore if this is what he was talking about when he said he was proud of the sale. … Western critics of Islam highlighted a recent broadcast of the network’s regular “Shariah and Life” show, which has an estimated audience of 60 million viewers worldwide. I don't rejoice in bad news. But President Obama should recognize the failure of his "more government for everything" policies. President Obama's defense of his economic stewardship has effectively amounted to this: At least we no longer have the Bush-era economy. With an entire 4-year term in the books, it's now possible to confirm, and to lament, the essential truth of those words. 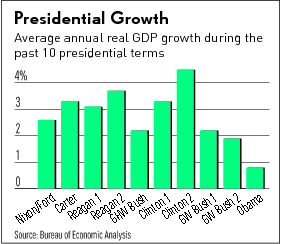 Prior to Obama, the second term of President Bush featured the weakest gains in the gross domestic product in some time, with average annual real (inflation-adjusted) GDP growth of just 1.9%. That's according to figures from the federal government's own Bureau of Economic Analysis (BEA). Obama's first term, however, puts the paltry level of growth during Bush's second term in a newly favorable light. According to the BEA, average annual real GDP growth during Obama's first term was a woeful 0.8%. To put Obama's mind-bogglingly low number in perspective, consider this: It was less than half the tally achieved during Bush's second term. It was barely a quarter of the tally achieved under President Carter. It was the worst tally achieved during any presidential term in the past 60 years. And here's the kicker: If it had been doubled (to 1.6%), it still would have been the worst tally in the past 60 years. True, Obama inherited a recession, but that recession only lasted for the first six months of his term. Eighty-eight percent of his term was post-recession. In comparison, that same recession covered fully one year of Bush's second term — a full 25% of it. Yet, Bush's second term witnessed well over twice the growth of Obama's first. Moreover, the abysmal performance of the economy in 2009 (Obama's first year in office) gave it plenty of opportunity to grow rapidly in the years to follow — there was essentially nowhere for it to go but up. The graphic: Investors Business Daily. Click to enlarge. Here is Obama's scorecard: Layoffs, bankruptcies and businesses closing = this week. Now he wants out of it and he wants Congress to do the heavy lifting. Looks like another chance to blame the Republicans in the House. There is an event celebrating walking/climbing Seattle's stairs Saturday. Seattle has plenty of them and several web sites that have information about them. The Washington Senate, led by Democrats Senators Tom and Sheldon and all the Republicans, is having substantial discussions about improving lower education and raising funding (used to be K-12, now pre-12). While in the House they are talking about raising funding and there is a shortage of other ideas, according to Peter Callaghan of the Tacoma News Tribune. And the Senate listened to a professor who shows there is no correlation between funding and educational outcomes. More money doesn't help unless it goes in the needed places. Washington Policy Center and WPC#2. The turnaround is nearly complete. The party that birthed the education reform movement in Washington state is now the anti-reform party. An issue that combined good policy with good politics has now been ceded by Democrats to Republicans. An issue that began as a response to the achievement gap between the rich and the poor, between white and Asian students and children of color has devolved into issues of public employee unions and conspiracy theories. This is puzzling because it was Democratic governors beginning with Booth Gardner who put political capital behind the drive to stop accepting the status quo of mediocre public schools. Each governor since has embraced the reforms – some more warmly than others. Sure, Washington has only had Democratic governors since 1985. But Democrats in the Legislature worked with like-minded Republicans to pass the first reforms in 1993’s House Bill 1209. That law created statewide learning requirements and tests to measure those requirements. The monastery and fortress at Shegar Dzong, Tibet is remarkable. It is built up a mountain like you wouldn't believe. The British team surveying a route to climb Mt. Everest in 1921 might have been the first Europeans to visit there. Into the Silence by Wade Davis tells about this visit. 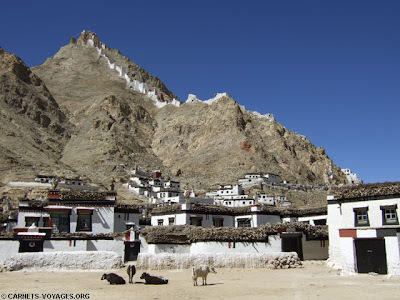 It was also on the route for the well known 1922 and 1924 Mt Everest climing expeditions led by climber George Mallory. Carnets-Voyages Sorry the text is in French. More history at …. Remarkable as it is, I can't find any on-line history of it. The Wikipedia article, titled Xegar, has two references, but no text. There are lots of tours that go there and travel reports like this one, but history. No. The photo: Carnets-Voyages. Click to enlarge. 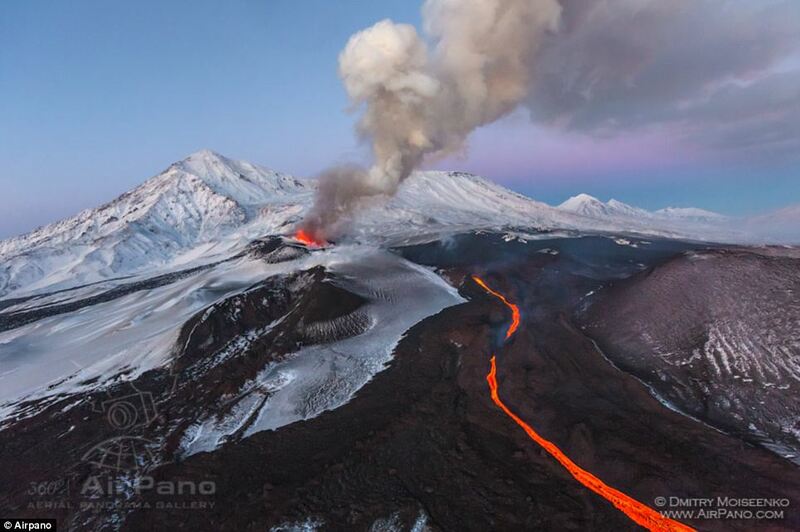 Stunning interactive view of the December, 2012 eruption of Plosty Tolbachik on the Kamchatka Peninsula, bordering the Pacific Ocean in the far east of Russia. The camera crew that specializes in 360-degree photos cancelled plans to be elsewhere and got there just in time to catch the beginning of the eruption. The second image is interactive. It a 360-degree photo that you can pan left and right. Zoom etc. For most people it's just as well to let it automatically pan to the right. If you use its tools to navigate the area on your own and get lost you can start over by reloading the page. The photo is by AirPano.com. Note the vertical splatter of the highest lava! Click to enlarge. We can't tackle our US budget w/o tackling entitlements. Patterico paints the picture clearly, showing how the numbers (don't) add up. If the so-called entitlements are truly programs that can never be cut, then we have to close the ENTIRE federal government - even the loving bureaucrats who hand out the entitlement checks - in order to stoop living on massive borrowed money. Is cutting the military and border control acceptable? How about the Food and Drug Administration and FBI? How about the Department of Health and Human Services? The Education Department? Veterans Affairs? If not, we have to save money on MediCare, Medicaid and other medical care. We have to look at Food Stamps and welfare. We have to consider Social Security. Patterico shows the situation in words and a few tables of numbers. Pretty compact. And he links to a video of the same. Dig a tunnel for Highway 99 under dowtown beneath many buildings? Under another tunnel? Yes. That is what they are doing. What could possibly go wrong? Of course they have done the civil engineering to make sure it is deep enough and that the soil will hold above it. But what if? A team of engineers and technicians are putting sophisticated sensors in place to get early data on any potential problem. 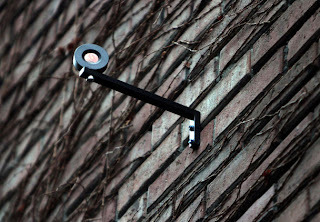 They are using at least seven types of sensors to watch 200 buildings. For example: Extensometers measure the solid density. If it drops the boring has probably encountered a void in the soil. But the primary method is at the boring machine: checking the soil being removed and watching for changes in the density of the soil at the cutting heads. A few years ago, soil-measuring errors caused a void that nearly swallowed a house above Sound Transit’s Beacon Hill Tunnel. Contractor Obayashi Corp had to reimburse taxpayers $4 million to locate and fill gaps. There is a lot of oil being produced in the middle of the continent, but limited capacity to get it to refineries both for domestic and overseas use. We are waiting for Obama to decide … waiting… waiting.. to approve the Keystone XL pipeline through the central US to the Gulf of Mexico. And Canada is trying to find a route for a new pipeline to one of the north British Columbia ports, but they are having trouble with that. Here is another idea. Make double the exisiting pipe from Alberta to Burnaby BC, which continues to the Washington refineries. For much of its route this can be done within the existing right of way - that's not hard. In some places development has encroached to the point the second pipe will have to take another route. Crosscut - a Seattle online news source. Prominent professional skiers were at Steven Pass Ski Area during February, 2012. Several small groups of locals and visitors decided to ski fresh snow on the back side of Cowboy Mountain (Seventh Heaven). Coming together in a large group of fifteen no one blew the whistle on all going at the same time. They triggered an avalanche that caught five of them. One escaped. One had a deployable balloon on her back that prevented her from being completely buried. Three were buried and killed. John Branch of the New York Times provides a very detailed account. Each page has a graphic and some are animated, especially the later one showing the descent slope from top to bottom.